Brandon: My name is Brandon Rollins. I make board games and I write about making board games in my blog, Brandon the Game Dev. I cover just about every subject you need to understand to go from having an idea to a complete product: game design, manufacturing, marketing, and a lot more. My first game was War Co., an expandable card game about a corporate sci-fi apocalypse. 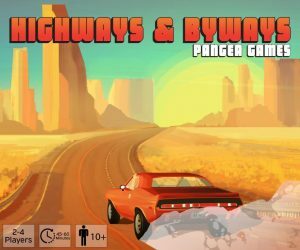 My second game, Highways & Byways, is about taking epic road trips across the USA. It’s coming to Kickstarter late this March, and I’m really excited about it! Kyle: So, why make board games? Brandon: I got into the board game industry because I was chasing a childhood dream. War Co. came out of a trading card game I made up as a kid when trying to reverse engineer a game from the Yu-Gi-Oh! cartoon. 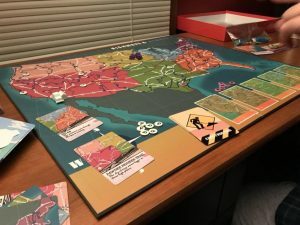 I had no intention of sticking around in board gaming, but I eventually came to really like it and started working on a blog and another game. Kyle: So you weren’t very involved in the hobby from the get go? Brandon: That’s right, it was chasing a childhood dream that pulled me into a much larger subculture than I expected. Kyle: That transitions nicely into our larger discussion. Is it safe to say that chasing your childhood dream with War Co was easier now than say, 10-15 years ago? Brandon: Oh, definitely. I was still in middle school. Brandon: Answering the actual question, back in 2004, there was no Kickstarter. There wasn’t really a hobby market for board games either, as classics like Ticket to Ride or Carcassonne had only recently been released. It wasn’t like what you see now with several games coming out every week. Kyle: Those days were easier on my wallet. Kyle: When I was a kid, I remember house ruling every game my friends and I could get our hands on. It started with a bunch of old games from my parent’s childhood that we had laying around and didn’t know how to play. The thought of publishing a game never would have occurred to me then, that seemed the realm of big companies with endless resources. Brandon: For the longest time, it was only available to companies with vast resources. I think three big things changed that made board game creation accessible to people like you and me. Demand: Games like Ticket to Ride, Catan, Carcassonne, Pandemic, and Dominion were much, much better than anything that came before and certain subsets of people noticed. Kickstarter: Board games were given a platform where anybody could come up with an idea, raise funds, and start manufacturing. Manufacturing: Because of the wider interest in board gaming and the presence of Kickstarter, a lot of companies started popping up that were willing to do print runs of 1,000 board games. Sometimes even less. Kyle: That’s a pretty thorough summary. How about we discuss each of those in more detail? Kyle: I know years ago Ticket to Ride was my “gateway game” into the larger hobby. It definitely spurred a period of exploring new games which has picked up steam with the hobby’s explosive growth in recent years. Brandon: Demand is straightforward to explain, but it’s the most important element out of the three. After the first handful of really good hobby board games broke into the market, it showed that people were still into board games. Of all things, board games! Brandon: At about the same time that hobby board games were taking off, so was the internet. That meant anybody who wanted any weird thing could be reached pretty easily. It’s a little ironic since you’d expect the internet to kill off board games, but it actually helped bring them to life instead. Brandon: With consumer demand came businesses and with businesses came businesses to support those businesses – namely small manufacturers. You didn’t need to rely on Hasbro or Mattel’s connections to get your game printed. You started seeing more printers coming out of the blue and doing smaller print runs. Again, no demand means no manufacturers to meet that demand. Brandon: Kickstarter was started in 2009. By then, board games had picked up a lot of steam, and Dominion, Pandemic, 7 Wonders, Small World, Cosmic Encounter, and a whole lot of other great, great games were on the market or hitting the market. None of these, to my knowledge, were Kickstarter games, but this just sets the scene. The board game industry was already flourishing. Brandon: Then Kickstarter comes along to this spark of creativity and pours gasoline on it. Suddenly even random people like me with childhood dreams can spend several months building an audience, use the Kickstarter platform to gather people in one place, and raise enough to create games that wouldn’t make it to market otherwise. Can you launch a game by going through a publisher? Sure. Can you launch a game by building an email list and setting up a storefront? Sure, Jamey Stegmaier did that with Charterstone. But Kickstarter is special because it’s a hang-out spot for people who love supporting ideas in their infancy, which is where most ideas fall apart. Brandon: I’m still trying to work it into a conspiracy theory personally. Kyle: Almost as if a lack of diversity in the traditional marketplace helped fuel the rise of new methods and approaches. Brandon: It may very well have. When you have something like limited shelf space, you get the “pop music” effect. Which is a term I made up just now. Pop music tends to follow the same chord progressions and it tends to inhabit a narrow emotional range. Nothing wrong with that – it just has a very specific purpose! That purpose is appealing to as many people as possible. Now if you’re filling up shelves and everything you put on a shelf displaces something else, then your board game can’t be super niche. It has to have pop appeal. It can’t be too weird. Brandon: But Kickstarter isn’t an environment of scarcity. You bring your audience and Kickstarter provides the venue. Same with other forms of online product launches. Kyle: The result being that most of the games you listed as demand fueling pioneers are now found on that limited shelf space in big box stores. And Kickstarter is now home to games with all sorts of niche audiences. Kyle: I would go as far as to suggest that Kickstarter has fueled traditional publishers to reach further and try different things as well. Kyle: Because as you said, Kickstarter is significant, but hardly the only reason for the hobby’s growth. Brandon: Sure! You have a lot of random first-time/second-time designers testing uncharted waters. Once the waters are proven to be good for trade routes, then the big publishers set sail. Kyle: It also allows the big publishers to identify promising new games and designers to partner with. I have recently seen publishers touting their affiliations with many of the most hyped crowdfunding games- ie “(insert publisher) is excited to be the (insert geographical region) distributor for (insert popular game that has yet to finish its crowdfunding campaign)”. Brandon: We could very well see the traditional business model of board games spun on its head. The conventional wisdom at the time we’re having this conversation is that crowdfunding is still the secondary way of publishing. The primary is by going through Asmodee or some other big company. We might see that get spun on its head in the next few years: crowdfunding primarily and publishers losing relevance. Kyle: Asmodee is becoming a behemoth, acquiring many of the large publishers or their IP’s. Many of the “challengers” to Asmodee’s dominance in the industry are already using Kickstarter to run massive preorder campaigns, reducing risk and cashing in on exclusive backer rewards. Almost as the video game industry has done. Brandon: And to be fair, Kickstarter gives you a much better estimate of demand than anything else I know of. Kyle: Can you elaborate on that? How does Kickstarter/Crowdfunding help estimate demand? Brandon: For one, you get to make sure that demand is actually there. Over time, a company can start to gather data on how much Kickstarter funding correlates to sales after the campaign. Kyle: How has increased demand and access to funding changed the manufacturing process? Brandon: This is where my understanding of history gets fuzzier. I’m not sure if there are more game printers or if existing ones dropped their minimum order quantities. I will say that if you tell a printer you’re self-publishing, a lot of them – at least the really good ones – will baby step you through the entire thing. Kyle: That kind of help and support is valuable, and it seems to be common in many corners of the hobby. I see publishers sending their experts on podcasts, printers providing the support you mentioned, all sorts of people providing helpful how-to content. Kyle: And to circle back to where we started, the internet has definitely facilitated that sharing. Brandon: Right. The internet either helped create demand for hobby board games or, at the very least, made it possible to tap into existing demand. Kyle: Has any of this made fulfillment easier on self-publishers? Brandon: I want to give you a straight answer on this question, but I feel like that’s tough. On the one hand, you have access to a lot of good companies like Games Quest and Fulfillrite who will fulfill on your behalf. Plus recent innovations like Stamps.com have made it easy to print postage at home so you can just drop off USPS packages at the post office. The tools for both domestic and international shipping have improved. Brandon: On the other hand, you now have the expectation that you’ll fulfill around the world. People from practically any country expect to be able to buy your games, and customers in major markets don’t want to pay import fees either. To do that, you definitely need a third party. If you put your game in a USPS box to a customer in the UK, they’ll get hit with a bill that asks for more pounds than the package weighs. It is easier to fulfill now if and only if you are able to find a good company or two to do the shipping work for you. Kyle: So am I hearing that the next big opportunity would be to start a board game shipping company? Brandon: If you’ve got an enormous amount of capital and very strong marketing skills, you could. But you’d have to get space, hire a ton of people, deal in enough business to get deeply discounted rates from USPS/Fedex/UPS to such a degree that you compete with existing companies. Kyle: Hey if it was a foolproof idea, we wouldn’t be giving it away for free right? Brandon: Nah, could at least get an online course out of it. “How to Run a Board Game Fulfillment Company” by Guy Who Makes Money on Online Courses. Kyle: We’ve touched on this a few times, but I’d like to expound a bit on how all these technology changes have made the development of a board game easier. What do you think the internet and other tech has done for design, testing, etc? Brandon: It’s hard to even begin to grasp the full extent of the impact the internet had on the way people approach game design. I’ll stick to specific examples. Websites like BoardGameGeek make it really easy to search for game mechanics and themes, saving you a lot of time in design since you can see what works and what doesn’t work. There is lots of room for creativity even still, you just don’t have to waste time going down dead-end roads on game design. Brandon: As for testing, print-and-plays are really popular on BoardGameGeek and Facebook. If your game is well-suited to home printing, you can have testers all over the world. 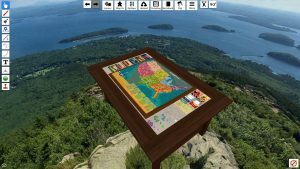 Even if you game doesn’t print well, as is the case with Highways & Byways, you can use Tabletop Simulator – a $20 Steam game – to play tabletop games with people virtually all over the world. You can even coordinate events. Brandon: That last one is particularly big for me – Tabletop Simulator is how I made both War Co. and Highways & Byways happen. They played a huge role in rapid prototyping and testing. Kyle: Which is all the difference between today’s homegrown games and my horribly imbalanced childhood house rules that only 2-3 people ever were exposed to. Kyle: So, now that we have discussed how this all happens, would you like to say a few words about your upcoming launch? Brandon: Sure thing, thank you! 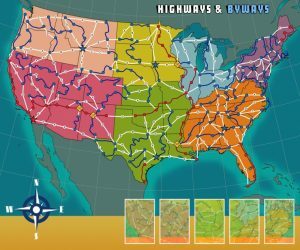 Brandon: I made Highways & Byways, which is coming to Kickstarter in late March. It is a casual family board game for 2-4 players and takes 45-60 minutes to play. In it, you take an epic road trip across the United States. You play by planning your route, moving a little bit every day, and managing Event Cards – which affect you both positively and negatively. The first person to finish all their Byways and circle back home is the winner. 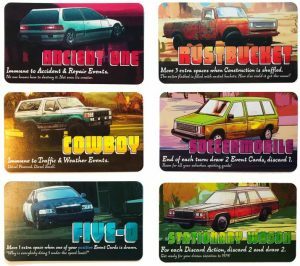 Brandon: If that appeals to you, sign up here to get an email when Highways & Byways is on Kickstarter. Kyle: We are looking forward to checking out Highways & Byways. Thanks for popping by and sharing your thoughts on the industry Brandon. There has never been a better time to explore game design or publishing your own title. Brandon: I completely agree. It’s a great time to make games. Thanks to Brandon for sharing his expertise. If you are an aspiring game developer, check out his blog for a whole host of resources. There has never been a better time to be a board game enthusiast. As technology and other innovations continue to connect like minds, more and more people are being enabled to share their games with others. This is leading to greater variation and diversity in the games published. While this at times can seem overwhelming, it is important to realize that nobody needs to purchase or play every game published. Ideally as more games are being released from a wider, more diverse group of designers, then more games are out there to introduce a wider, more diverse group of people to this wonderful hobby. There are plenty of things contributing to the rise of the hobby and the accessibility of self-publishing that we didn’t touch upon in this discussion. Let us know what we missed!